Limited Registrations Now Available for SWeETy Camp!!! 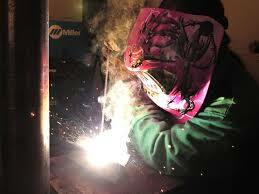 Sweety Camp is our annual Summer Welding & Technology Camp for Girls who attend area high schools grades 9th - 12th. We are currently searching for any last minute students who may want to attend this year's camp, as we have had several students who initially reserved a seat in camp, and have since dropped out and and will no longer be able to attend. Therefore, we have about 9 Seats open at this time (6-16-16). We would like to extend the invitation to your students (Female Students Only) who may be interested in participating in this year's camp. The Camp Details are listed below my signature, so please feel free to share this information with any students you have that may be interested in taking advantage of this exciting educational and fun week-long activity. Since camp starts next week(Monday June 20) we are very limited with time, so the sooner your students can respond, and the sooner you can share this information with your students, the better chance they have of getting to take one of the few remaining seats that still remain- so please act fast if your student is interested. I can collect all the information needed via email, and can call the parents to follow up with their detailed information if they provide their cell phone number in the original email. Thanks again for your help with this, and good luck! This email is to confirm some of the important details for our campers who have confirmed their attendance in this year's Sweety Camp which is next week. NOTE: If you have already responded with your RSVP, then we look forward to seeing you there. Camp will be next week (Monday) June 20 - (Thursday) June 23. Students should be dropped off each day at the ATC Building which is at the farNORTH END of the CALHOUN DECATUR CAMPUS. See the Map links below* *Many of the electrical technology activities will take place in our classrooms inside the ATC Building, and the Welding activities will be held in our welding facility which is located behind the ATC Building. Students will be closely supervised by Camp Staff and Instructors at all times. Safety is our first priority, therefore, each student will be given extensive safety information regarding the fun and educational activities they will be doing each day. Lunch will be provided daily for students. We will plan to have a variety of options for students; however, if your student has a specific dietary request or food allergy, please let us know so that we can accommodate accordingly. PHOTO RELEASE FORM: In compliance with state and college legal regulations regarding pictures of your students during camp, we require students to complete the attached PHOTO RELEASE FORM in order to participate in pictures. Please print off and complete the PHOTO RELEASE FORM- we will collect this the first day of camp upon arrival, and maintain this in the students application file. WAIVER OF LIABILITY FORM: On last day of camp (Thursday 6-23-16), students will be taken on a tour of a local welding & electrical industry company facility, which will be our grand finale 'field trip'. In compliance with state and college legal regulations regarding travel, students are required to to complete the attached Waiver of Liability Form in order to participate. Please print off and complete the WAIVER OF LIABILITY FORM - we will also collect this on the first day of camp, upon arrival, and maintain this in the students application file. If you should have any questions prior to camp, please let us know.